The Brits are taking over the royal jewel starting lineup this week, although we've got a few other royals on the roster, too. 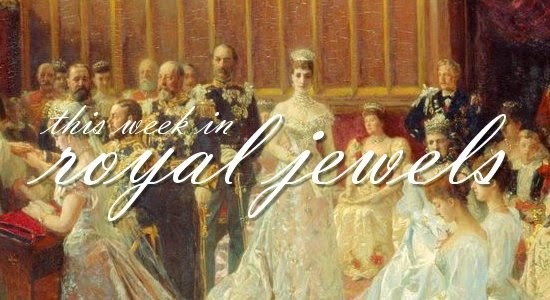 Be sure to vote for your favorite jewels in the weekly poll! 10. The ladies of the Japanese imperial family -- including Crown Princess Masako! -- appeared at a garden party on Thursday wearing pearls and brooches. 9. During her trip to New York, the Countess of Wessex observed Veterans Day on Wednesday by wearing a jeweled poppy brooch. 8. Queen Maxima's spiky statement necklace made another outing on Wednesday in Amsterdam. 7. Elaborate earrings were Queen Letizia's jewel choice for an engagement in Madrid on Thursday. 6. In New Zealand on November 5, the Duchess of Cornwall wore a diamond thistle brooch that originally belonged to her husband's grandmother, the Queen Mum. 5. Queen Maxima joined the Windsors on Remembrance Sunday in London this year, wearing pearls and a diamond brooch to secure her poppies. 4. Queen Elizabeth II selected one of Queen Victoria's diamond bow brooches for Remembrance Sunday this year. 3. Elizabeth II wore one of her most glittering and most frequently worn brooches, the Cullinan V, for a visit to the Home Office on Thursday. 2. At the Festival of Remembrance on Saturday, the Duchess of Gloucester wore a lovely set of sapphire and diamond jewels, including a distinctive pair of clips. The set came from the collection of her late mother-in-law, Princess Alice. 1. My top vote of the week goes to Elizabeth II's Festival of Remembrance jewels. She donned Queen Alexandra's Wedding Gift Brooch, complete with its pendants, one of her two-stranded pearl necklaces, pearl drop earrings, her pearl evening watch, and multiple diamond rings.